The main difference between pepsin and protease is that pepsin is a type of protease functional at the stomach whereas protease is an enzyme which hydrolyzes the peptide bonds. Furthermore, pepsin cleaves internal peptide bonds while protease may either cleave internal or terminal peptide bonds. Pepsin and protease are two types of enzymes responsible for protein catabolism by the hydrolysis of peptide bonds. Pepsin is the main proteolytic enzyme of vertebrates. It occurs in the gastric juice and is responsible for the breakdown of proteins into small peptides. It occurs by the hydrolysis of peptide bonds. Especially, pepsin is an endopeptidase that hydrolyzes internal peptide bonds. Gastric mucosa produces pepsin in the form of pepsinogen, which is the inactive form of pepsin. The HCl in the gastric juice is responsible for the activation of pepsinogen into pepsin. Moreover, the active site residue of pepsin is aspartic acid. Since the gastric juice is highly acidic, pepsin functions in the acidic medium. Furthermore, pepsin is responsible for the hydrolysis of peptide bonds between large hydrophobic amino acids. Therefore, its specificity is towards the peptide bonds in the aromatic or carboxylic L-amino acids. The hydrolysis of peptide linkages mainly occurs at the C-terminal of the phenylalanine and leucine residues. A protease is an enzyme which breaks down proteins into small peptides and eventually into amino acids. Proteases belong to a distinct family of enzymes, and they are sometimes called proteinases, peptidases or proteolytic enzymes. They are more abundant in animals but are also present in plants, algae, bacteria, and viruses. Apart from digestion, proteases play a major role in the immune system to destroy pathogens. The two main groups of proteases are exopeptidases and endopeptidases. Exopeptidases breakdown terminal peptide bonds, resulting in peptides and amino acids. Aminopeptidases and carboxypeptidase A are examples of exopeptidases. On the other hand, endopeptidases breakdown internal peptide bonds, resulting in small peptides. Pepsin, trypsin, chymotrypsin, papain, and elastase are examples of endopeptidases. 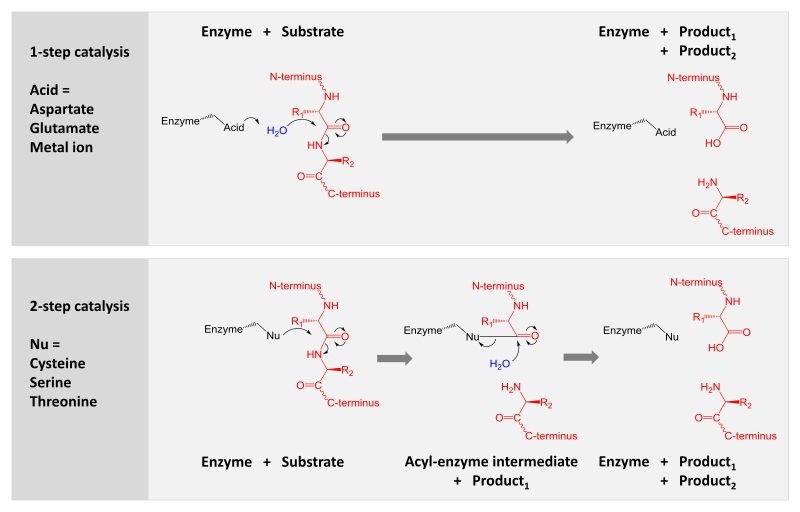 Moreover, proteases can also be classified based on the catalytic site. 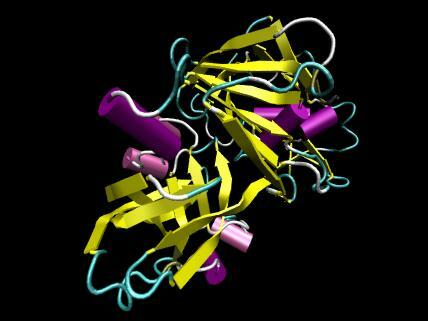 Pepsin and protease are two types of enzymes responsible for protein catabolism. They hydrolyze peptide bonds between amino acids in both proteins and peptides. Moreover, the digestive system uses them to digest proteins. Pepsin refers to the chief digestive enzyme in the stomach, which breaks down proteins into polypeptides. While protease refers to an enzyme which breaks down proteins and peptides. Thus, this explains the main difference between pepsin and protease. Also, pepsin is a type of protease while proteases are a family of protein digestive enzymes. One other difference between pepsin and protease is that the stomach secretes pepsin while different parts of the elementary tract including the stomach and pancreas produce proteases. Furthermore, pepsin is an endopeptidase while a protease can be either endopeptidase or exopeptidase. Also, pepsin is an acid protease while a protease can either act in the acidic, neutral or basic medium. Hence, this is another difference between pepsin and protease. Moreover, the active site residue of each also contributes to the difference between pepsin and protease. In pepsin, it is aspartic acid while the active site residue of a protease can be either serine, cysteine, threonine, aspartic acid, glutamic acid, asparagine or a metal group. Another difference between pepsin and protease is that pepsin breaks down proteins into small peptides while a protease may break down a protein either into small peptides or amino acids. In addition, there is a difference between pepsin and protease in their applications too. Apart from digestion, proteases are important in digesting antibodies, collagen, and are used in various protein digestibility assays while proteases are a part of laundry detergents and also bread improvers. Aliphatic alcohols, pepsin A, and substrate-like epoxidase are some pepsin inhibitors while alpha 1-antitrypsin, alpha 1-antichymotrypsin, and C1-inhibitor are some protease-inhibitors. Thus, this is another difference between pepsin and protease. Pepsin is a type of protease which serves as the main digestive enzyme in the stomach. It is responsible for the hydrolysis of internal peptide bonds, resulting in small peptides. On the other hand, proteases are the protein digestive enzymes which break down proteins into small peptides and amino acids. Therefore, the main difference between pepsin and protease is the role of each proteolytic enzyme in the body.